ActivCard, a specialist in IDentity Management software for remote access, single sign-on and digital ID card solutions, announced an expanded cooperation with its partner Precise Biometrics AB, developer and provider of world-leading and user-friendly biometric security solutions based on fingerprints, to deliver smart card-based identification (ID) badge solutions with biometric authentication. ActivCard has incorporated Precise Biometrics' technology for fingerprint matching on smart cards, "Precise Match-on-Card", to its "ActivCard Gold 2.2" software, the most successful and widely deployed smart ID card middleware platform available on the market today. 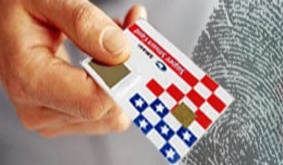 By verifying the fingerprint that's on the card, the Precise Match-on-Card method guarantees that the reference biometric template (the user's identity) never leaves the card, so it is not subject to theft. E-Smart Technologies, Inc. is dedicated to the complete elimination of financial fraud and identity theft, and to its vision of a world where national and personal security will help to guarantee peace. The Company was formed in 2000 to develop and market the ultimate biometric verification system. It succeeded in creating and being granted the patent what experts believe to be the only tamperproof biometric smart card using a completely on-card fingerprint sensor and matching system. E-Smart’s match-on-card technology is uniquely hardware based and software enhanced, with a multi-application operating system for contact and/or wireless use and works with existing smart card readers. Its fraud-proof on-card positive identification systems enable totally secure access and transaction applications, while completely protecting personal privacy. They're considered to be a leading provider of high technology security systems that can be used to combat fraud and terrorism. E-Smart products enable government agencies and commercial enterprises to continuously and securely verify, certify and manage identification and access of citizens, personnel, customers and any other persons seeking physical or logical access. E-Smart is the exclusive provider of the Biometric Verification Security System(TM) (BVS2)(TM), featuring the Super Smart Card(TM) for Asia and the US, which experts believe to be the world's only commercially available smartcard with a full on-card matching system for biometric ID verification.